Jobs in Seychelles: The Seychelles is an archipelago of 115 islands in the Indian Ocean, off East Africa. It's home to numerous beaches, coral reefs and nature reserves, as well as rare animals such as giant Aldabra tortoises. Mahé, a hub for visiting the other islands, is home to capital Victoria. It also has the mountain rainforests of Morne Seychellois National Park and beaches, including Beau Vallon and Anse Takamaka. 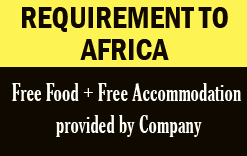 Free Food + Free Accommodation provided by company.